in the waning of that self I grow and glow." The science of astrology is a study of the interlocking forces of all the 12 constellations as they pour into and through all the kingdoms in nature, carrying with them also their own individual qualities as well as those of the seven rays, focussed through the sacred andnon-sacred planets of our solar system ~ the discovered and undiscovered planetary Lives. The vision of these powers and their many weaving lines, seen as rivers and streams of light, is given to the initiate from the mountaintop of Capricorn, once that summit is reached. the mortal brother with the light and life of God." The following material on Gemini is from "The Pilgrimage of Necessity"
by Frances Adams Moore, reprinted 2000 by Meditation Groups, Inc.
Gemini brings the process much closer to the physical plane of expression. Gemini creates the patterns which will emerge finally as visible forms. Gemini is the design-maker, the weaver of patterns of force and energy. It is the beginning of duality, of the separation in consciousness, of intercommunication between polarities. 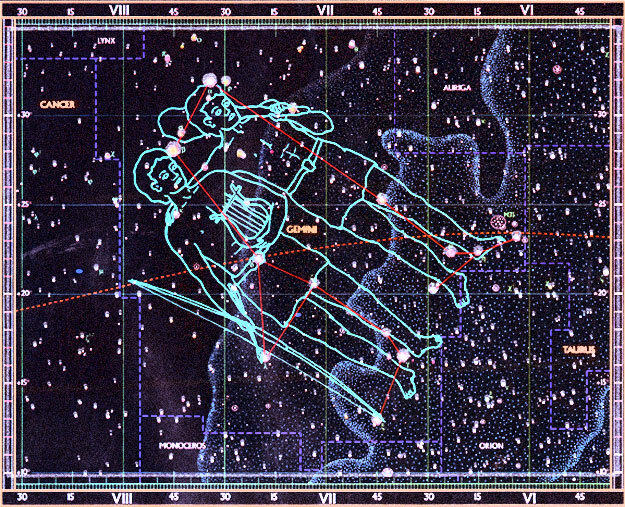 Gemini has been called The Way of Many Changes. At this stage, the separate seekers for the Grail might be said to meet and separate again, as each creates his own path. The All consciousness of the Source, perhaps, begins to sense differences within itself. This emerging sense of difference represents the first cleavage in consciousness. Individuality, the separation of the unit from the Whole, of the spark from the Central Flame, is now sensed. The long period of "interior thought and mystical longing; the training after the vision," the longing for knowledge, for experience, the "spasmodic attempts at self-discipline, at prayer and meditation, precede the determination for real and steady effort." The tests of Aries and Taurus behind, the separated unit has to register in his or her brain-consciousness the fact that he or she is not only an expression of divinity or deity, but is also individual and unique and must now begin to differentiate between the two aspects of expression. The soul aspect makes its impact, but is not yet a reality in consciousness.